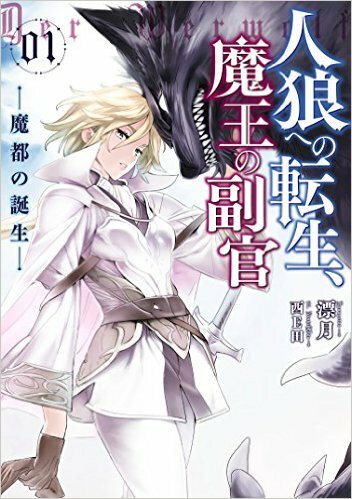 Protagonist Vaito, who was reincarnated as a werewolf magician, becomes the Vice Commander of the Third Division of the Demon Lord’s Army. Making the violence loving demons obey, doing something about the always complaining humans, today also he is working hard as the main leader of the demon army. Since there weren't any written reviews of the recent chapters I thought it would be a good reason to write my thoughts so far. The MC works under the demon king in charge of a human city which he subjugates peacefully, much to the surprise of his fellow demons. His physical strength equates to normal werewolves but leads since he can become stronger with his unique magic. The main story so far is about how the MC werewolf deals with the would-be rebels before they actually have a chance to... more>> rebel. There is not much romance in the story, with the female side characters only thinking that the MC is "nice". There are a few fights mostly seen on the large scale from above showing the mc's strategy to defeat the opposing army. It's very similar to OverLord. One of the best WNs I've read. Humans are the Villains. The Author surpassed my expectations. This is truly brilliant. I love all these good Characters... Not only is it dark to some degree but a good amount of Humor. I only wish I could read the LN.. Anyways this needs more Translating. No game nonsense, silly dues ex machina, evolution crap or numbers. The issue with reincarnation is barely emphasized. The MC has balls and is by no means the strongest. Can't really say much more as not enough is out. oh tasty this one is... but I am not sure why. It's not missing anything that wouldn't put it in a book store. I would recommend this to the supernatural/fantasy along with kingdom building fans as it's got that kind of flavor. Now if only that would fix that next button... I can't seem to get to 21 yet. If you like a logical, strategic, or realistical reincarnation novel, this one is the thing for you. MC reincarnated as a werewolf, doesn't really have attachment to his previous life, and think very logically. Not your everyday OP MC where he gets to be the top boss suddenly, working slowly with his limitation and condition. Not a super dense, and an agreeable MC. It's a shame the translator didn't get author's permission to translate and stopped the translation ever since. Decent enough novel, mostly about governing, with a few battles. I'd say that the main flaw is that the characters are left way too blank, despite having the opportunity to flesh them in multiple occasions. The writing is not bad, the translation mostly right, so it does help to get into the story itself without having weird phrases everywhere, too many "sound effects", or the sadly common huge line spacing between phrases to pad the "content" of chapters. There is nothing especially outstanding, and the main characters are not "evil" despite being monsters... more>> and fighting humans, it's mostly a case of fighting for their own survival. At least we don't have a protagonist that's completely withdrawn like usual, and while a bit naïve in how problems are handled, it still feels like something that could potentially happen, rather than badly put together for plot reasons. Also, the style doesn't seem to change (up to now at least), so if the first few chapters make you feel that it's not worth your time, forcing ahead is probably not going to change your mind. I'm really liking it, both the army/kingdom management and battles. But I especially like the emotions the MC has and how that affects his decisions, good and bad (making him both wise and reckless). It's definitely written well and I can realy empathize to the MC. There are no cheap tricks/plot armour and as a reincarnator, he's not unrealistically knowledgeable or adaptive. We can still see the gaps between his current and previous world occasionally. Ok, I am the person who always uses logic to judge a novel so I can assuredly say that this novel is quite good. There are some points I want to show you guys. Background setting: no Truck-sama, no Summoning, it's just like afterlife of some Japanese. Rarely some will regain their memory from previous life, and MC is one of them. MC: rational guy. He acts very civilized (not doing any unnecessary killing, think first before action, his actions although not very deep but still considerably wise). He is also not an OP character, he even weak than normal werewolves! However he can use his memory from previous life and some magic to outsmart other werewolves (I love these nerd-type character, and I really like the idea using buff-magic to increase his physical capabilities to maximize werewolf's advantage: physical body). This is a sort of slow-paced, leisurely war novel. There's no tension that isn't almost immediately resolved so far. There's some fighting, some city building, some politics. It's certainly not bad, but nothing really stands out and I don't find myself eagerly awaiting new chapters. Actually, it's weird how generic/inoffensive it feels when you have a werewolf protagonist who slaughtered 300 people in a single battle, but for every cool scene like that you have ten scenes where he sips tea and wonders why people think he's so amazing. This is a pretty fun series involving an MC reincarnated into a werewolf. He was smaller than the other werewolves, so he trained his magic instead to become the top dog. Thanks to his human memories, he has more strategies and creativity available to him. He uses this in his battles against the humans and changes their impression of demons. The MC gave everyone the impression he was OP when he was really just clever and knew a few tricks to turn the tide. It's funny how the rumors about him... more>> increase every time he returns to a city. Of course, he's not the only character with secrets to hide. The story is interesting, but not enough for me to hang off my chair. The MC feels sorta generic in personality. He's calculating and good at manipulation. It's interesting that he's a werewolf aide and not the Demon King or a Hero or something. Heck, he's not even the only reincarnated dude. It's interesting that the story focuses on him, not the Demon King. The characters are okay, not too interesting but enough to be slightly memorable. Great novel although it's a usual Humans vs Demons premise. The MC is likeable, balanced and not overpowered (he's neither the hero nor the demon king). He kills when he has to but is not a xianxia honey badger killing everything that moves. Diplomacy is used to win over cities when he can and we can believe he's a better ruler than the humans. There's more strategy warfare than single encounters but both are well done. Don't agree with the slice of life tag btw as most chapters are story... more>> related with few fillers with other's POV. This is a must read for people who likes fantasy genre and one of the best in this site. i purrresenally like it very much. About Story: atm (ch. 46) still no real rom, MC has a Crush on a werewolf girl of is village and (main?) female (possible?) has only 1 ch. Were she begins to notice MCs charm. ... more>> Apart from this its more sice of life of MC while governing occupied city and winning over Human Hearts. The pace is (for me at least) perfect, not rushed and not stretched. Characters a bit too less described for my taste, esspacially The (good ol' Werewolf) Village people. Some first Chapters describing the Village life like in the Manga would have been Fun. Both Groups have a good english, about the correct translation I can not say much, because I dun understand jap. But I have/ had a bit of a problem, when the translation gone to the races, tried to google some, so I could image what they would look at least somehow, 'cause they are not really (well?) descriped. Skills and Spell Casting is good translated sounds really nice ~su. I had to drop this in 30+ chapters. It becomes stupid just like any other japanese novels in this site. The depth of the story that I sought after is now gone and gone to oblivion. The only thing that keeps me reading this despite not having interesting events, characters, plot, dialogue etc. Is that the story has depth and coherent. If you read goblin kingdom then it is worst than that. Decent novel with great characters and an interesting plot. I can't go anymore into it if I wanted to, not that it would need more said. It was picked up by J-Novel at some point which is an instant drop for me. Not that they do bad work, but because I have no money for a subscription. For those who can pay for things like that without it making them wonder if they will have dinner that day? Good for you. Despite a promising start, this story is actually pretty boring. Everything is very simplistic and shallow, and success just kind of falls into the MC's lap without any real effort. If you're expecting political intrigue, negotiations, or faction play surrounding the town the MC is occupying, don't. There's none of that here. As of Chapter 34, there are four named human characters in the town, two of whom only appearing once. There is nothing to this town. As for the MC, the reincarnated part of the title is basically just a title.... more>> Except for a scene or two where he recognizes some japanese-like food, it adds nothing to the story. There's one occasion where he tries to use modern knowledge, but it turns out to be something that already exists. And that's basically the MC's only defining character trait, other than being kinda smart. The strategy at play in the battles here are also pretty shallow and not well-thought-out. The first seems fine, but later developments make it seem like it should have been impossible. Also, the magic in this world is inconsistent and useless. For example, the MC's teacher is described as someone who could "disintegrate the viceroy's castle with a fingertip, " but when they assault a city they sort of forget she can do that and go with a frontal assault instead. And then she passes out after casting a single lightning bolt. Interesting. It's a story more realistically than normal transmigration and reincarnation stories. As far as I read, there is a lot of strategical mind plots and quite a few brawls. There is romance with a good wine and funny twists as well.